When my daughter was two months old, I met a group of moms with babies the same age at a breastfeeding support group, and we eventually split off into our own playgroup. It was supposedly for the kids to get together, but really we all needed the social outlet! Two and a half years later, we still get together. We don’t get the kids together weekly as we once did, because it’s hard to coordinate their schedules — some are in preschool, others have lessons and classes and naps and siblings, etc. But we still get together for Mom’s Night Out every now and then and get the kids together for special occasions like birthdays and holiday celebrations (and annual photos!). We have another avid crafter (we’ll call her B) in our group and several moms who scrapbook, so I suggested a Mom’s Night In (my favorite kind of Mom’s Night Out) — B hosted, and I brought the crafts. I designed an 8×8 scrapbook page for the 8×8 scrappers and a 12×12 page for the 12×12 scrappers, and I also brought a card, which some of the girls made. This is the 8×8 page, which I designed first. Can you tell I’m SO ready for fall? I’ve been ready since May! It’s my favorite season, and it follows my least favorite. The background paper is Soft Sky, which I am LOVING for fall, especially with Crushed Curry. 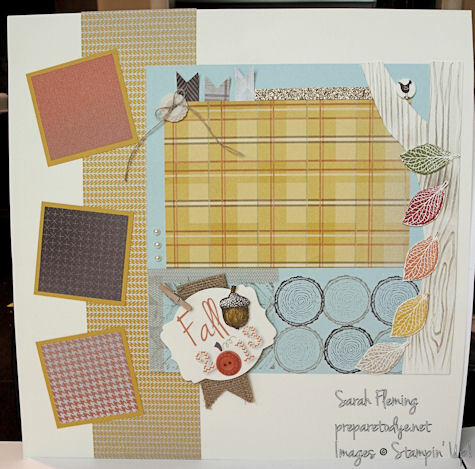 I used the Truly Grateful stamp set, perfect for fall cards and scrapbook pages. The wood pattern in the lower left corner, the logs, and the acorn are all from that set. Thanks to the Stamp-a-ma-jig, I was able to get the logs perfectly lined up. I love this tool! The paper for the photo background and the little flags are from the Sweater Weather designer series paper. I think I’ll need another pack of this paper, I love it so much. Perfect for fall and for baby books. I hand-cut the tree with scissors, then embossed it using the Woodgrain folder. The folder isn’t long enough to do the entire tree, so I embossed the bottom part first, then turned the tree upside down to do the other end. This doesn’t work perfectly, the lines don’t quite match up, and I ended up with a horizontal line across my tree. That’s why my green leaf is horizontal — it hides the line. Use embellishments to hide imperfections, and no one will know the difference! The leaves are from the retired French Foliage set. I started with green, then the leaf faded to red, orange, yellow, and finally brown to show the fall progressing. I can’t remember if I came up with this on my own, but it’s been floating around in my head that I want to do this on a fall page since last year. I may have seen it on Pinterest; I don’t remember. I made the title in My Digital Studio. I’ve only recently started playing around with MDS. I wasn’t too excited about it (I like paper, not the illusion of paper) until I watched through the entire collection of MDS tutorials, and now I’m pretty much in love with the program. I will be using it a lot for my scrapbook pages, especially to make titles. The little pumpkin in the title is from the retired Button Buddies stamp set, which is still available in MDS. I just sized it down until it fit the button I wanted to use. Sorry for the lousy picture here. I tried everything but standing on my head to get the page to stay put on the easel. For the 12×12 page, I decided to use the same 8×8 square and then just add on. I think this is a great way to take any 8×8 layout and turn it into a 12×12 layout. I simply added a piece of 12×12 Very Vanilla cardstock, a 12×3 strip of Sweater Weather paper, and some frames for three 2×2 photos. I also added the burlap ribbon (this ribbon is awesome) and clipped it behind the title using one of those adorable tiny clothespins (available in the Tag a Bag Accessory Kit). If I’d thought of it when designing the 8×8 page, I would have added it to that page as well. I left the space under the 8×8 page for journaling. I had so much fun designing these pages, and we had a blast at our Mom’s Night In. I hope you like them. You can buy the supplies to make these projects in my Stampin’ Up! store 24/7. I’m mentioned in your blog! Way cool!!! Hahaha! I’m glad you approve!